Workman Publishing Company, 9780761147039, 247pp. It's looking like another banner year for America's moneyed over-class, the lucky .0001 percent sitting on $30 million-plus in liquid assets. But sadly, most of the newcomers joining their ranks are simply not prepared to make the decisions that come with having it all. Unsure about everything—butler or majordomo? St. Tropez or St. Thomas?—they will blow their hard-earned billions on tacky houses, outrageous wardrobes, and outré diversions of various stripes. Because, while there are countless ways to make a fortune these days, there's still only one way to be Filthy Rich. Fortunately, in the spirit of The Official Preppy Handbook—the 1.3-million-copy bestseller that taught all of us how to be WASPily top drawer—help has arrived. A dead-on, deadpan guide to living large in the land of plenty, The Official Filthy Rich Handbook yanks the monogrammed pashmina off a world few mortals ever get to see. Packed with insight and savvy, it brings this rarified universe to scandalous new life, feeding our endless fascination with the tastefully loaded, while offering practical instructions for those who dream of joining them. In it, you'll learn not only where to live and what to wear, but about the things that really matter. How to hire a household staff. The right cosmetic surgery procedures for you...and your children. The proper way to name your houses. The sacred role of privet hedges. Why the Filthy Rich swim naked. The down-and-dirty on your fellow plutocrats (The Nerdling, The Raider, and the Grande Dame, to name a few). The moochers and scoundrels to know and avoid. How to buy a gigayacht. The right spots to party in Sardinia, Aspen, Nantucket, and St. Barts. The world's hottest tax havens. The four interior decorators worth waiting for. The Filthy Richest rehabs. Boarding schools of the rich and feckless. Why it's so hard to break into the art market and how to sound smart about Richard Serra. And much, much more. The rich "are different from you and me," F. Scott Fitzgerald wrote. Wait until you see the Filthy Rich. Christopher Tennant has previously chronicled the foibles of the rich and infamous as an editor and writer at New York magazine, Talk, the New York Post's "Page Six" column, and Radar, the influential pop culture magazine and daily web site he co-founded in 2003, which was nominated for a General Excellence award by the American Society of Magazine Editors. Born and raised in the leafy suburbs of Boston, he currently lives beyond his means in New York City. "Reading this handbook is like eating 12 baked Alaskas in a row, but Christopher Tennant seems to know la dolce vita Americana billionara, every sweet morsel of it." "There are three kinds of humor. Parody, where you make fun of people who are smarter than you. Satire, where you make fun of people who are richer than you. And burlesque, where you do both while taking off your clothes. 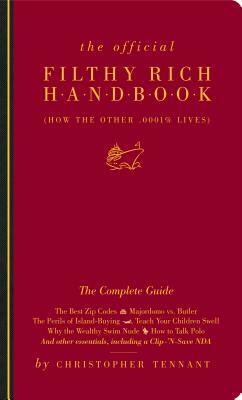 The Official Filthy Rich Handbook is a paragon of naked wit." "I had a wonderful time reading The Official Filthy Rich Handbook. I learned a lot of things I didn't know, and chuckled at Christopher Tennant's extraordinary upper-class information."